Stephen is recognised as the first Christian martyr, and Acts Chapter 7 depicts one of the longest speeches recorded in the New Testament. He was described as a man full of faith and of the Holy Spirit [Acts 6:5,7:55], a man full of God’s grace and power [Acts 6:8], a man with wisdom and spoke with the Spirit [Acts 6:10]; a man with the face of an angel [Acts 6:15]. Those were descriptions. There were also evidences of his great faith and his grace. In the face of powerful accusers, he stood firm by faith and rebuked them. In the face of physical threats, he stood strong by faith, and became the first man recorded to give up his life for Christ. Even in the face of death, his grace showed as he prayed for his persecutors. Stephen was a man with a short-lived life, but he lived for the Lord and died gloriously for the Lord. He had little screentime in the Bible, but today when we talk about faithful biblical characters, Stephen would always be in that list. His dying words in Acts 7:59 – 60 clearly takes inspiration from the death of Christ. We will be focusing on Stephen‘s grace, and on martyrdom. As much as he was full of faith, it is a topic for another day. Lord Jesus, receive my spirit [Acts 7:59]- similar to the last line of Christ, said with his last breath on the cross [Luke 23:46|Article], though Stephen offered his spirit to Jesus, while Jesus offered his spirit to the Father. That’s a notable difference which speaks volumes about the beginnings of the Christian movement and how Christians can now pray to Jesus (you don’t see anybody praying to Jesus while he was in his ministry!) – though that’s another topic for another day. If he being able to pray while standing and being stoned isn’t amazing enough, he then kneels – not because he was felled over by his assaulters, but because he is entering a deeper level of reverence – kneeling in prayer. While he prayed for his own spirit, Stephen was merely standing. But when he wanted to pray for forgiveness of his murderers, Stephen fell to his knees! 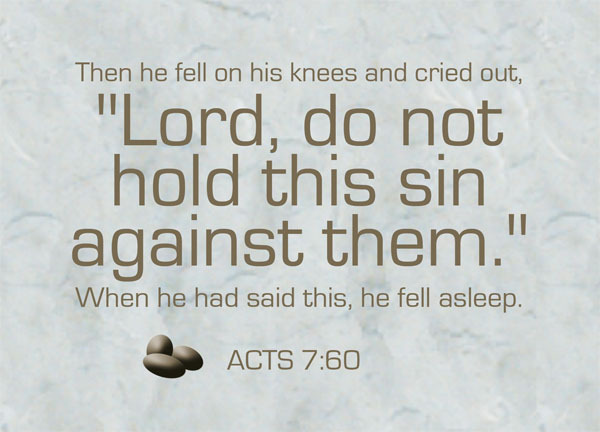 And if that’s not enough, while he commended his spirit to Christ, he prayed, but when he petitioned for the attackers, he cried out, as if desperate that his petition be heard – Lord, do not hold this sin against them – and saying that, he fell asleep. It was common for the Jews to refer to death as falling asleep. In essence, even as Stephen did not forget to commit his spirit to the Lord, he put his attackers before himself and prayed for them with greater passion than for himself. All this while being stoned by them. For all the great wonders and miraculous signs [Acts 6:8] that he did in his life, the only one that was recorded was his death sequence. Jesus himself was an example when he prayed for those who had persecuted him while he was dying on the cross [Luke 23:34]. Their transgressions were similar, they were the same people who shouted ‘crucify him, crucify him‘ [Luke23:21] when Pilate wanted to free Jesus. I won’t try to analyse the state of mind of Jesus when he said that, but Stephen? When will a man be able to put down the bitter or vindictive nature of a human and embrace a forgiving heart? I’d like to think it is when his sight is so clearly set on the heavenly realm that he no longer feels any need to justify and defend himself. His death in the eyes of men may be brutal and crass – but surely to him, it was a glorious moment. He had seen the glory of God, and Jesus standing at the right hand of God [Acts 7:55]. Jesus is usually described to be sitting at the right hand of God, and not standing [Mat 26:64; Mark 16:19; Luke 22:69; Eph 1:20; amongst others] – it’s almost as if the Father and Son are welcoming him personally into the heavenly realm. And Stephen was described at that point again to be full of the Holy Spirit. Father, Son and Spirit. It is complete. The Holy Trinity is with him. He has nothing to fear, nothing to worry about. His future has been assured. He has no need to be angry at his attackers, and so he wasn’t. He no longer need to hold on to earthly emotions. He was at peace. Stephen was a man of grace, and aided by his sight of the Father and the Son, and aided with the presence of the Spirit in him, his grace expanded. To be able to consider for your enemies, pray for them passionately and desperately with your last breath, despite knowing that you will die in their hands. Surely such amazing grace is only possible because of God. How beautiful is the will of God! That the persecutor of Christ named Saul, who oversaw and approved the murder of the first ever Christian martyr in Stephen, would later become the apostle Paul, who planted many churches, did much work for the foundations of the early Church, left the world with great teachings, and eventually was martyred as well. It comes a full circle. Have you ever wondered why God allowed for great Christians to die for him? If they had remained alive, surely they could have done more work for the Kingdom of God? I think the case of Stephen answers this question very aptly. Had he not died, surely he would be an important asset to the early Church Christians, and do much good work for the Kingdom of God. But God took him away, and gave the Church a great apostle in Paul (by the way, also removing one enemy by converting him). I don’t think it’s a one-for-one exchange (Paul was such a special case), but God‘s work won’t end just with one death. God will always send new people to take over. And I don’t know if all the martyrs in history saw what Stephen saw at the moment of life and death, but I’d like to think they would have been comforted by his example, as their death will be glorious and their entry to the heavens welcomed by the Father and the Son. Maybe you are willing to die for the Kingdom’s cause. I applaud you. However, which martyr, in the face of death, scolds his attackers and tells them that they will rot in hell? (it’s probably true though, if they aren’t saved?) That’s probably not good enough for a martyr. Want to die gloriously for the Lord? It’s not just about dying. It’s also about putting your life behind the lives of those who do not deserve consideration. It’s about blessing those who persecute you, blessing and not cursing [Rom 12:14|Article]. From the Bible, to a lesser degree, Paul demonstrates it too – May it not be held against them [2 Tim 4:16] was his prayer for those who had deserted him. Before we get ahead of ourselves in wanting to die for the Lord’s cause, let us first try to emulate Christ, or his faithful and graceful servant, Stephen, in faith and in grace. An excellent anaylsis and quite moving. It goes to how God views our hearts and our motivations. While the Bible says God gets angry, it more importantly says he IS love, and that’s a big difference.